It took some serious detective work to discover that my daughter was allergic to a meat if it had been fed one of her severe allergens. She could not tolerate any poultry. She had symptoms if her beef was not 100% grass fed. And in one case, she ate elk just fine, yet reacted to elk from a difference source. We learned that the elk had been supplemented to help them survive a lean winter. The common denominator to them all was what the animals had been fed. Many would not think twice when comparing conventional or organic produce. One quick internet search will reveal thousands of articles and research studies documenting the difference between the two. We are all well aware that through the produce we choose, we are eating what the plant was exposed to. We buy organic produce to avoid the chemicals in the soil, and the pesticides or fertilizers used as it was grown. We would eat those. They would affect us. They remain on and in the plant. This also applies to the animals that we eat. Your mainstream allergist may not tell you this, and may not even say it is possible. But it is entirely possible, and becoming more of a reality for many. 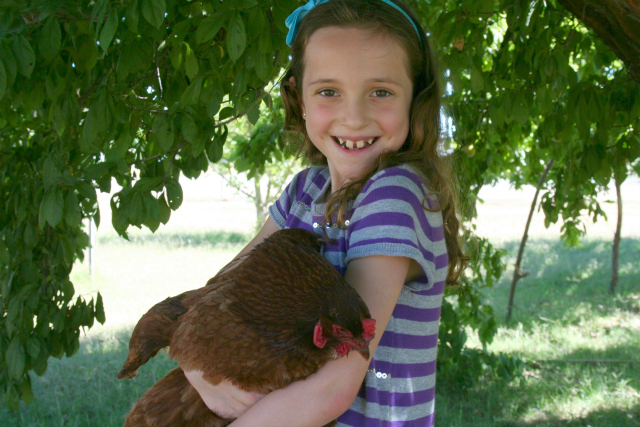 This was the number one reason we dove into raising grain free chickens. I started researching and asking questions. I wanted confirmation that what an animal was fed ended up in their meat, and how long it would stay there if the feed were changed. I also wanted confirmation that it would show up in eggs or milk. I spoke with veterinarians, scientists, farmers, and anyone I could think of who might have an answer for me. Some said it would take a couple days to have a feed leave the animal’s body, and some said it would never leave. I found no medical studies, and no answers. It was ridiculous. What I did find was that the food industry had lots of information.For obvious reasons, companies who sell meat are highly invested in how it tastes and how well it sells. As a result, the food industry has conducted a ton of research regarding the effects of diet on animals, specifically corn and soy. As you may guess, they discovered that diet affects color, body structure and even reproductive patterns. For example, methods to test meat labeled ‘corn fed’ were developed in order to regulate this claim. It was discovered that corn left high levels of xanthophyll, which changed the color of chicken meat from white to yellow. Today, while mainstream medicine still lags behind, agricultural science is catching up. I had no idea that a few years prior a study had already been done to answer my questions. In 2009 a grad student at Ohio State University conducted a study on the presence of soy in eggs and meat. This study is extremely exciting for me. So exciting that I have attempted to track down the author, Dante Miguel Marcial Vargas Galdos, just to send him a thank you note. I am not sure he had any idea what his study did for those with severe food allergies like my daughter. Do you know him? Please thank him for me! Mr. Vargas Galdos took chickens who had been fed a soy diet, and then changed their diet to the soy free Tropical Traditions Cocofeed. He then monitored the levels of soy in their eggs. At the end of 28 days the hens were euthanized and their tissues and organs were tested. It takes ten days for soy to leave the eggs of a chicken previously fed soy. At the end of 28 days, the meat and organs had no measurable amount of soy. 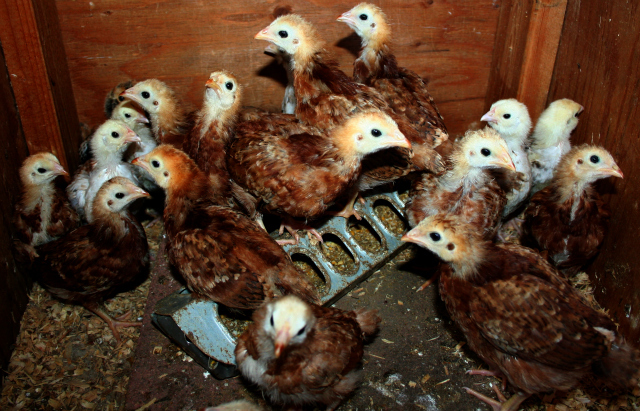 If you have specific dietary needs, you can obtain adult hens, change their feed, and have safe eggs in 10 days. In addition, you can have safe meat birds in 28 days. I am still unaware of any direct medical research regarding allergies to a meat due to the animal’s diet; however, thanks to Mr. Vargas Galdos, we have the confirmation we need. Yes, you can have an allergy or intolerance to meat simply because of what the animal was fed. I already saw the evidence in my own home, but now we have some science to back it up. One last reminder: In the case of any allergy or intolerance, the sensitivity of the individual determines the reaction severity. Not everyone will have issues with what an animal was fed. However, no one should be eating soy, and it is clear that in the case of soy-fed eggs and chicken we are all getting a hefty dose. If you would like more information on why soy should not be a part of your diet, I recommend reading The Whole Soy Story. Hope is contagious. Pass it on. 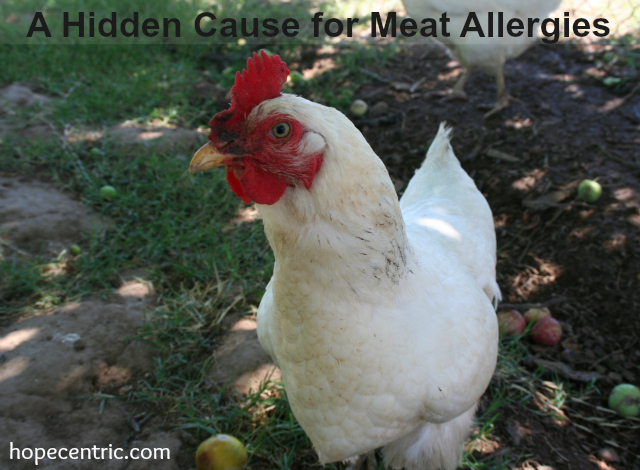 Have you experienced allergic reactions to meat due to what the animal was fed? Or does this put together some puzzle pieces for you? Perhaps you are already on the journey of growing your own allergy friendly food! I would love to hear of your journey and to learn from you. Be sure to tell me about your expeirences below. Thank you so much for this! I knew it, too, and just erred on the side of caution. But it is so nice to hear that there is actual proof! I’m curious; do you know of any studies done on other animals, like cows or lambs? You are awesome, btw. Just in case no one has told you that lately! Hi Carrie! I have not seen any other studies done, but have absolutely no reason to believe the principles behind it (regenerating of tissues, etc) would be any different from species to species. I would guess that it might take a little while longer in a larger species, and that in the case of milk it might take longer to be removed depending on how long digestion takes. Overall for us we are calling this a green light for any animals previously fed grain, soy or corn! Wow! This is so interesting. Thank you for sharing this information. I think it will be valuable to a lot of people. I’ve read the Whole Soy Story and I agree with you–we shouldn’t eat soy, but that’s easier said than done. Amy, I completely agree. This study shows how difficult it can be to eliminate soy. It is certainly hard to source chicken and eggs without it. Wow!!! Nichole thank you so much! I know the last time we spoke…a while ago you didn’t have this information yet! I am SOOOO happy to know this! we have a family raising a hog for us. it will only be soy free for 60 days. So this is excellent news! We were praying it would be safe for Kadin and now I know it should be!!! thank you for all your research and for sharing it with everyone. You are truly amazing. Will there be a third part to this series? I would like to know specifically what you are feeding your chickens. Are you mixing it yourself or buying it? I cannot find a place to purchase the Tropical Traditions Cocofeed mentioned. Are you using Scratch ‘n Peck feeds? It is great to know that it only takes 10 days to get the bad stuff out of the chicken’s system. We are using Scratch ‘n Peck for our hens, but we are having trouble figuring exactly how much to order each month so often it seems we are resorting to the stuff from Tractor Supply. I’d love to mix my own feed, but do not have the resources available for that here. Hi Amy! Yes, I am working on getting that info out as well. I believe you have to order the Cocofeed straight from Tropical Traditions, and the last time I checked it didn’t appear as if they were selling it anymore. Do you have a feed store near you that stocks bulk bags of seed? It was costly, but in the beginning we sourced ingredients from a local Winco. Thank you so much for this post and the link to the study! I don’t know how long I’ve been searching for this kind of information! it explains why so many dogs and cats are allergic to chicken nowadays. Hi, I’ve just found your chicken posts. I’ve been wanting to go grain-free with my hens and you’ve just inspired me to do it (and the oats ran out today!). My Aha! moment on grain-free meat/eggs/animal fat/fish happened when we tried a different brand of lard after our regular farmer at our farmer’s market ran out- it triggered my daughter’s reflux and gave her bad eczema. I have have been feeding my New Hampshires oats, cooked meat, scraps, oyster grit and flaxseeds and they’re laying well. My son is OK with their eggs, but my daughter isn’t, so it’s now time to ditch those oats and see if it makes a difference for her. Thanks for tracking down the research on how long it takes for the eggs to be “clean”. I was also planning to get some hybirds but having read your posts I’ll stick with the good foragers! My 22m daughter has significant food allergies. We have purchased all grass fed meats for her (1/4 cow, full birds and 1/4 lab and pig). When we got our last cow, she has been refusing the meat. Last week, she had a bite of beef and instantly she went into anaphylaxis. I talked to the farmer who said there is a chance a grain fed cow was tagged his at the slaughter house as another allergic customer had a similar reaction. I am going to the allergist in 3 weeks with my grass fed beef for testing. She had been tested for a meat allergy in the past and it was negative. CORRECTION! – LAMB not lab!!!! My daughter was tested with the same piece of ribeye she ate. She is confirmed anaphylactic to beef. The allergist said that there is no way the grains consumed by the animal can affect the meat due to the breakdown of the grain in the digestive system. I am convinced that the temperature of the meat is what is causing her reaction. I looked in my allergy book (I take very detailed nots) and the only other time she had a reaction to beef was when she had steak. I believe the ground beef, stew etc was easy for her to digest because it was over done. The steaks were grilled medium. The allergist states there is no research to verify this but does not think it is possible. Her IgE showed a moderate to high reading. The doc still wants to challenge the beef in the hospital in about 6 months. I am terrified. Hi Erica. That’s unfortunate about your doctor. I think a hospital challenge of a confirmed anaphylaxis response would be terrifying as well. Does your doctor have a reason for why that might beneficial? In case you were not aware, I have heard multiple stories of children whose anaphylaxis allergies have been healed after time on the GAPS diet. Exciting and hopeful stuff! We did the oral food challenge with well done and medium meat. She ended up passing. She doesn’t love meat but can tolerate it. I really think it was that particular cow. My daughter was allergic to beef and pork. She reacted to them with hives and vomiting, and possibly eczema (she had at least 12 food allergies so there is no way to know which caused the eczema). She was not allergic to corn or soy, but was allergic to wheat and rice. 1)Dose. She doesn’t eat a lot of egg products, so maybe it’s fine every four days or so, but not every day. 2) Chicken diet or chicken variety. She isn’t allergic to the things chickens eat (that I know of) but possibly the diet or even the type of chicken affects the combination of proteins in the eggs. Most of our eggs are from a friend’s chickens or I buy pastured eggs, but sometimes we have “regular” eggs and I haven’t kept track of which she has eaten, but will now. 3) Heat/Cooking. On the advice of our allergist we did a “desensitizing” program. When she was eight she was suddenly able to tolerate eggs that had been baked at 350 for at least 20 minutes (like cake and brownies or quiche). She was to eat small amounts daily. It seemed to kind of work. Her reactions when she did react got much milder. She still reacted, but only sometimes, to eggs cooked less than that, like cookies or french toast. But again, it could have been the type of egg. Today she ate very thin pancakes with eggs that only cooked about 4 minutes, but at a high heat and was fine. Living here in the mid-south here in TN, there is a tick that carries a virus causing people to become allergic to meat except poultry (chicken). It has spread to other states around TN too. One an additional note, we have read about animals that were on GMO feed and changed to organic feed. Some animals took weeks to be purged 80% others took 6 months to be purged. Plus the animal health improved greatly too. Thanks for posting your research here on meat allergies. Every bit helps to bless others. Hi Nichole, I have been following your blog for a while now. Like your daughter, my daughter and I are allergic to grain fed meats. I am looking into getting chicks in a week or so to raise for both meat and eggs. I have found multiple grain free feed recipes, but am having a hard time finding one to feed the day old chicks. I have seen that you can feed grass fed, raw clabber, but I have no access to enough raw milk to do so. Do you have any suggestions? Hi. I am a mother for new born son. He has a skin rash on his forehead. I have been a vegan never eating out. Always cooking with organic ingredients. Now my husband and I have cut down rice which has so much arsenic causing my son to cry all night. But this was just a start to finding out he can’t eat meat which are farm raised. Non of the meat are 100% grass fed. Same goes for milk. But when we ate rabbit caught in the wild, he had no rash. However last night I ha d tried bio lamb, and this morning his forehead is completely red. Good news is that we can eat bio spelt ( white flour ) steam bread with raisin raised wild yeast since the husk of the spelt takes away most of the toxins. Other than that he can’t even take beans. Thank you for your post! My daughter cannot tolerate grass-fed beef as she us extremely allergic to ragweed and other grasses. When these grasses are in high season, she cannot eat any fruits or vegetables that have cross pollinated with these grasses (Oral Allergy Syndrome). I had never even considered that eating grass fed beef might cause a problem, but it most definitely did. She ate a grass fed beef burger one afternoon–nothing else. Shortly thereafter, she began having trouble breathing, her palms, underarms, torso, and soles of feet were red and extremely itchy. She proceeded to start vomitting violently as well. Basically, she was having an extreme allergic reaction to the grass fed beef. Her allergist suggested that it was most likely the grass fed beef and she stay away from it during allergy season. That happened a few years ago, and she has not tried grass fed beef again, but can eat grain fed beef. It is interesting to hear of a reverse story, and I can see how that would absolutely be possible. Ellie can not eat meat from grass fed cows if they were fed with a type of grass she is allergic to. Hey Nichole, I stumbled upon this article when I looked up sudden allergic reactions to chicken. For the past 17 days I have been eating EXTREMELY clean. We’re talking no butter, no oils, no carbs really at all, just an apple or orange, lean meats and white fish, and green veggies. That’s it. (Special diet) For the past two days I have eaten chicken that has not been labeled organic, and my face feels like there are a million tiny pins poking it. It’s a bizarre feeling. I can only think of one thing, that my body is now extremely sensitive to any and all chemicals they put in chicken. It was intense uncomfortable tingling when I ate a chicken breast from Tyson (who is known to be shady with their chicken) and tonight it was trader joes chicken (frozen not organic). Could this be what you’re talking about? What kind of symptoms did your daughter have? oh goodness that doesnt sound fun at all! My daughter actually had FPIES and EGID. She also has epilepsy. Her food reactions range from vomiting to colitis to seizures. Have you heard of the Gut and Psychology Syndrome (GAPS) diet? It is the healing diet that we used to heal my daughter. She can now eat conventional chicken on occasion without issue, though we still raise our own grain free chickens at home. Your body needs quality fats in order to heal and stay healthy, so the fact that you are eating lean meats and no oils could be part of your struggle. Here is a link to another post I wrote about GAPS in case you want to know more. Healing can certainly be had! My daughter is proof. Have hope! Hi. This is all very interesting. My son is allergic to sunflower seeds. Sometimes eggs bother him but not always. I was wondering if hen eating seeds could contribute to this? Thank you! Yes, it could be an issue if your son is sensitive enough.